I like to call Bruce Swedien the "Godfather" of engineering, but his mentor, Bill Putnam, was truly the father of modern engineering. In this video, Bruce talks a bit about Bill, and also about the development of the Harrison console, which was the sound of Thriller and other Michael Jackson albums that Bruce engineered. A reader called "Noise" asked for a song analysis from Roxy Music's seminal album Avalon , so I decided that the big hit from the album, "More Than This," would be a good choice. Avalon was the band's seventh and final record, but they went out with an album that Rolling Stone rated as #31 of the 100 greatest albums of the 80's. The album was produced by Rhett Davies and engineered by the incomparable Bob Clearmountain (it's a crime that he's never won a Grammy). As with all song analysis, we'll look at the song form, the arrangement, the sound and the production. After the third chorus, the verse enters again and repeats instrumentally. There's never a vocal after that. You almost get the feeling that they ran out of lyrics or ideas for the song after 2:34 when the vocal stops. The arrangement of the song is wonderfully 80's, in that it's well layered with lots of elements. * The Pad: The synthesizer playing string parts. The best thing about the arrangement is it's so layered and varied. The synth strings support the vocal and the fills change from section to section. Once again the sound is wonderfully layered using different ambient textures. Some verbs are long, others are lush and others are short, while you hear timed delays on the guitars. especially like how all the guitars sound different from one another yet never get in each other's way. While the toms sound huge and have a great tone, the kick, drums and bass are somewhat small compared to the rest of the mix, although it works well in this song. The production on "More Than This" is pretty typical of what you'd find in the 80's with a lot of different parts and layers. Again, listen to all the guitar parts, as sometimes there's 3 or 4 happening at once, yet they all manage to live together without stepping on each other. Also notice that most of the guitar parts are single note, and not chords. The tambourine on beat 4 of every other measure and the shaker for motion are both nice touches. Also listen to how the vocal in the verse alternates between being doubled and just a single lead. Good microphone isolation mounts are both expensive and very delicate. 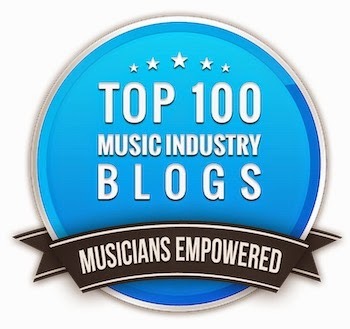 Plus, it doesn't take much for the bands that hold the mount together to come loose, and some people just can't figure out how to reconnect them. Here's a video about how you can build your own iso mount from some pretty common materials. It doesn't exactly look like one from a manufacturer, but certainly serves the purpose. Here are 5 of the 10 myths about vinyl records from recordpressing.com. These are the ones I liked the best, but you can read the rest here. Not even close. Vinyl is the only physical music medium that is increasing in sales. In 2009, more than 2.5 million vinyl records were sold in the United States. Best Buy, the third largest music retailer, now has 50 stores that carry vinyl albums. False. There’s no doubt that pressing machinery is in high demand with the incredible resurgence of vinyl records. However, very little new manufacturing equipment is being made today. For example, the last cutting lathes were manufactured in the 1980s, and can only be found through independent service consultants and cutting room service departments. False. If this were true, I would have tried getting my hands on one a long time ago. 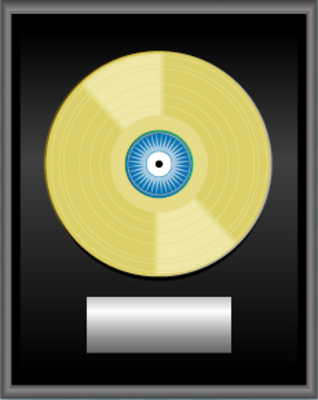 When an artist goes “gold” or “platinum” it refers to the number of albums that were sold. Initially, trimmed and plated metal masters, mothers, or stampers were used to make the awards. Most gold and platinum records are actual vinyl records dipped in metallic paint. Sorry metal detector aficionados. False. In the vinyl manufacturing process, special paper is used and baked to remove all moisture that makes adhesion possible. There is no glue used in the manufacturing process. Instead, special PVC melted into rubber patties, called “biscuits,” are placed between two record labels in a press. A metal stamper is used to apply pressure at a very hot temperature to melt and mold the biscuit and labels together to create the vinyl record. Read the other 5 here. 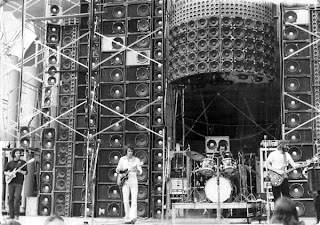 I can across this page recently about the incredibly innovative "Wall of Sound" sound system used by the Grateful Dead for their 1974 tour. Since the band only used the system briefly, not many people know about it, but it certainly was very forward thinking in so many ways. For as good as recording was in the 60's and 70's, live sound system technology had really only started and lagged far behind. The systems were tiny by today's standards, with a lot of non-matching components used by PA owners just to be able to cover the audience. Plus, on-stage monitoring was still in its infancy, so every artist had a difficult time hearing themselves. This is what prompted the Dead's sound crew and Alembic to come up with a way for the band to not only hear themselves, but to give the audience the best possible listening experience as well. 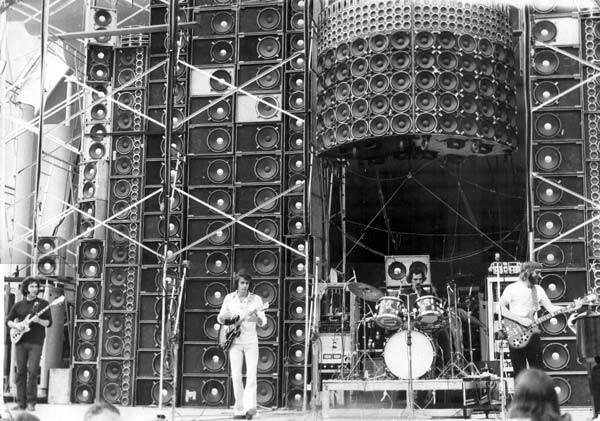 The "Wall of Sound" was actually comprised of 11 independent sound systems, as you can see from the picture on the left. 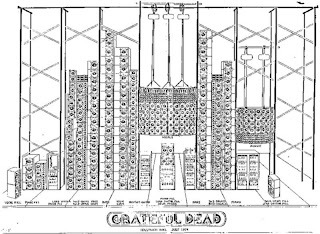 There was one system for the vocals placed in the center, one for each guitar, one for each string of Phil Lesh's bass (yes, you read that correctly), one for the piano, one for both drummer's bass drum, and one each for the rest of each drummer's kit. 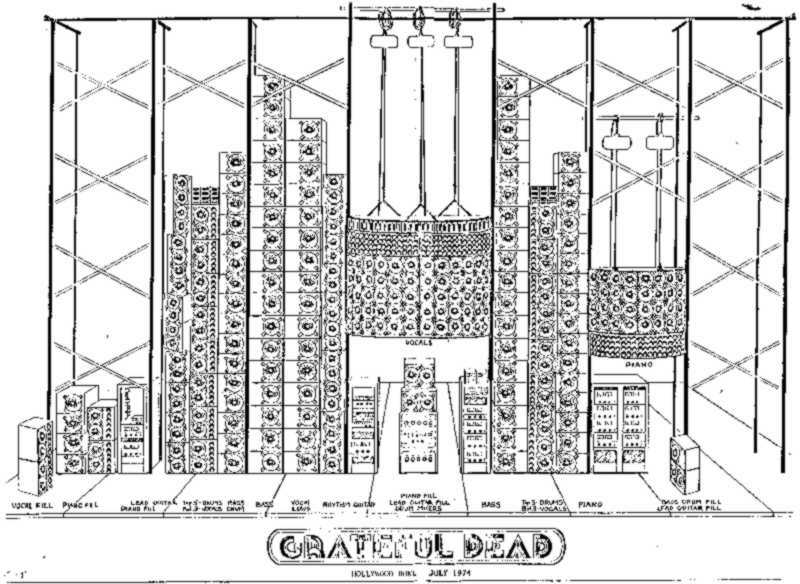 Each system was placed behind the player so they could hear it, and since each system was made up of multiple speaker cabinets, could be directed so that most of the sound was aimed directly at the audience instead of bouncing around the venue. The individual systems were powered by 300 watt per channel McIntosh amps, which were always noted for excellent sound and about the most powerful amp that you could get at the time. The crew came up with an innovative idea for vocal miking using differential mics that really made the whole thing work however. They put two directional mics out-of-phase with each other and spaced them 60mm apart as on the left. 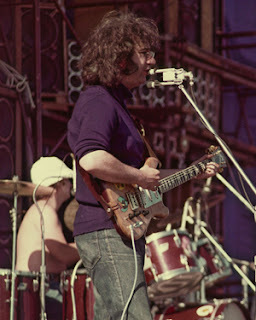 This meant that anything coming into the mic other than a vocal sung very close to one mic would cancel out, so you'd only hear the vocal in its particular sound system and nothing else from off the stage. The reports were that the system sounded incredible and was insanely loud and clean for the time, so it garnered nothing but raves. Back then this system was light years ahead of any other sound system on the planet, and in many ways, it's never been duplicated. The Dead only used it for a single tour because it was unusually costly to transport and very labor-intensive to set up, but it's something to marvel at even today. You can read more about it here and here, which has mostly the same info but different pictures. The pictures were taken by Richard Pechner, and you can view more images of The Grateful Dead and their Wall of Sound on his website.